PSA 10 Mike Modano O-Pee-Chee Premier 1990 Gem Mint #74 Minnesota North Stars RC. Condition is Brand New. Shipped with USPS First Class Package. 1990-91 Upper Deck Mike Modano Minnesota North Stars RC Rookie. Warehouse Sportscards. The complete team set includes regular player cards from Series 1 (1-150) and Series 2 (151-300). Each card is in near-mint to mint. The 12 cards in this team set include Item(s) must be in their original scanned condition. Will receive card in photo. Card is in mint condition. Buyer pays $1.25 for shipping. 1990-91 O-Pee-Chee OPC Premier #74 Mike Modano RC PSA 10 Gem Mint. Shipped with USPS First Class Package. MIKE MODANO AUTOGRAPHED 1990 OPC PREMIER ROOKIE CARD. THIS CARD RECEIVED A PERFECT 10 AUTOGRAPH AND A MINT 96 FROM SGC. Beckett (BGS & BVG) Grading. Beckett Grading Service ("BGS") is a high-quality sports card grading service for cards ages 1981 to present. "Value ," like Beauty, is in the eye of the beholder. Autographs (AU)(Auto); Jerseys; Patches; Swatches; and other Relic Cards (e.g., Hockey Stick, Baseball Bat, Towel, etc. ); and. 2 MIKE MODANO 1990 SCORE HOCKEY ALL ROOKIE TEAM CARD #327 GREAT ROOKIE! ALL OUR ITEMS HAVE BEEN TREATED WITH CARE. MOST OF THEM LOOK BRAND NEW. IF THIS IS A ITEM FOR YOUR COLLECTION ,OR GIFT SATISFACTION IS 100% GUARANTEED OR RETURN IT FOR A REFUND NO QUESTIONS ASKED ALL OF OUR AUTOGRAPHED ITEMS ARE 100% SATISFACTION GUARANTEED OR YOU CAN RETURN IT FOR A FULL REFUND!. 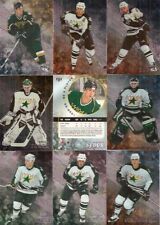 1990-91 Score RC Mike Modano ! Any Blemishes in the Picture is a Result of the Scan and not the Card Condition Unless Stated in the De scription. You are purchasing a complete regular team set of Dallas Stars from the 2009-10 O-Pee-Chee Hockey set. The team set is pulled from the 600-card initial release and the 200-card update set. The 23 cards in this team set include. You are purchasing a complete regular team set of Dallas Stars from the 2007-08 O-Pee-Chee Hockey set. The team set is pulled from a hand-collated 600-card set. The 23 cards in this team set include. BOTH CARDS ARE IN NRMT-MT CONDITION. MIKE MODANO. SIGNATURE STICKS SIGNINGS. SWEET SHOT. 2006-07 UPPER DECK HOCKEY. AUTO SP #20/25. PLUS RIGID SUPPORT ON BIG PATCH CARDS. IT HAS BEEN GRADED GEM MINT 9.5 BY BGS. You are purchasing a complete Master team set Dallas Stars from the 2008-09 Upper Deck Victory Hockey set. The 15 cards in this team set include Mark Fistric (RC). Item(s) must be in their original scanned condition. You are purchasing a complete team set of Dallas Stars from the 2005-06 Parkhurst Hockey set that was produced by Upper Deck. The complete team set includes A Salute to Captain (CPT), Team Logos (TL), Northern Stars (NS), rookie cards (RC) and Team Checklist (TC) cards when applicable.